The ‘overall insecticidal effect’ is a key measure used to evaluate public health pesticides for indoor use in experimental hut trials. It depends on the proportion of mosquitoes that are killed out of those that enter the treated hut, intrinsic mortality in the control hut, and the ratio of mosquitoes entering the treatment hut to those entering the control hut. This paper critically examines the way the effect is defined, and discusses how it can be used to infer effectiveness of intervention programmes. The overall insecticidal effect, as defined by the World Health Organization in 2006, can be negative when deterrence from entering the treated hut is high, even if all mosquitoes that enter are killed, wrongly suggesting that the insecticide enhances mosquito survival. Also in the absence of deterrence, even if the insecticide kills all mosquitoes in the treatment hut, the insecticidal effect is less than 100%, unless intrinsic mortality is nil. A proposed alternative definition for the measurement of the overall insecticidal effect has the desirable range of 0 to 1 (100%), provided mortality among non-repelled mosquitoes in the treated hut is less than the corresponding mortality in the control hut. This definition can be built upon to formulate the coverage-dependent insecticidal effectiveness of an intervention programme. 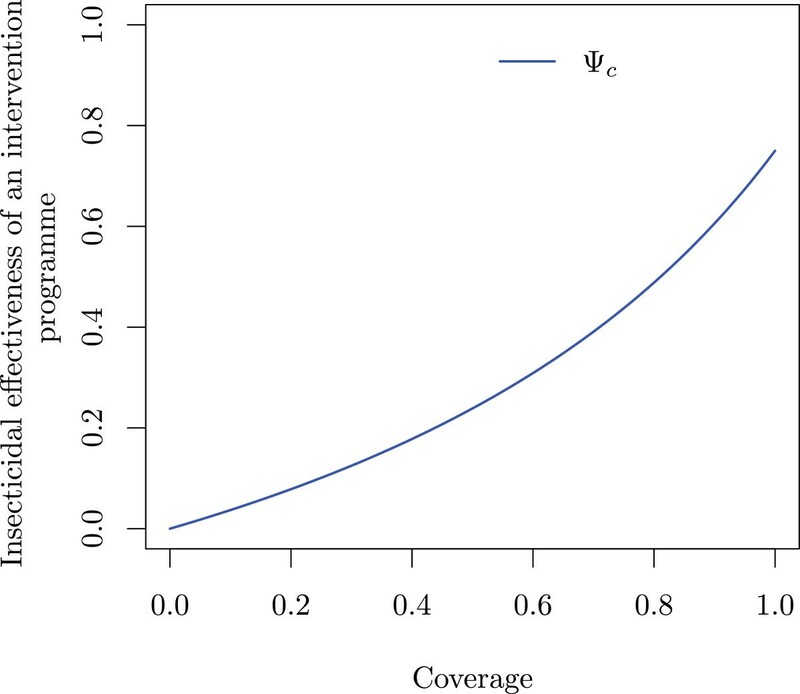 Coverage-dependent population protection against feeding can be formulated similarly. This paper shows that the 2006 recommended quantity for measuring the overall insecticidal effect is problematic, and proposes an alternative quantity with more desirable properties. Phase II experimental hut trials are the main means of evaluating insecticides used in indoor interventions against mosquitoes at field level. The World Health Organization Pesticide Evaluation Scheme (WHOPES) provides guidelines on how such trials should be carried out and analysed . The potential impact of insecticides on disease transmission is measured by two key effects: personal protection against bites, and the overall insecticidal effect. The overall insecticidal effect depends on the killing of mosquitoes that enter the hut and the deterrence of mosquitoes from entering the hut, compared to a hut without the intervention. μ 0 = D 0 E 0 = μ 0 ⋆ 1 − ρ 0 . 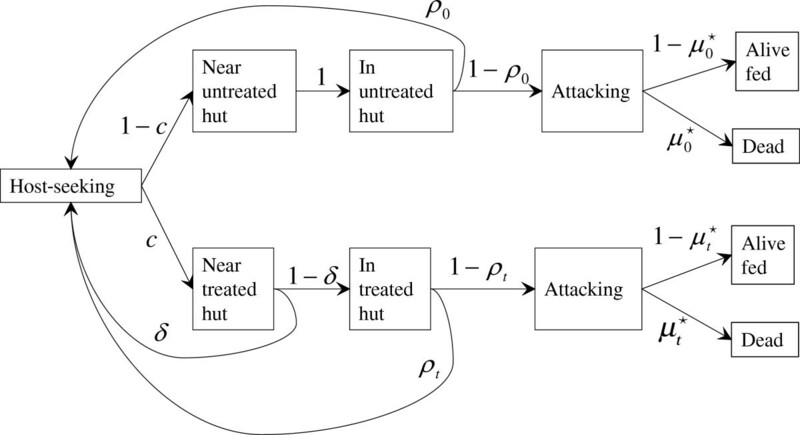 Using Abbott’s formula for “per cent control” , the proportion of mosquitoes that enter the treated huts that are killed by the insecticide is then the excess risk of being killed, μ t − μ0. The ‘proportion control’ or efficacy, ω, of the intervention to kill these mosquitoes is obtained by dividing the excess risk by the proportion of mosquitoes entering the hut that would have survived, if not for the intervention treatment, i.e. ω = μ t − μ 0 1 − μ 0 = E 0 E t D t − D 0 E 0 − D 0 .
assuming that the entry rate in treated huts is less than or equal to the entry rate in untreated huts, so 0 ≤ δ ≤ 1.
σ = μ t 1 − δ − μ 0 1 − μ 0 = D t − D 0 E 0 − D 0 . WHOPES  recommends that, instead of measuring the overall insecticidal effect as the proportion of host seeking mosquitoes that would have survived in a control hut, it should be measured as the difference between treated and control huts in the number of mosquitoes found dead, expressed as a proportion of those host seeking, i.e. σ ' = D t − D 0 E 0 = μ t 1 − δ − μ 0 = σ 1 − μ 0 . The definition σ seems preferable to σ′ as an ‘overall insecticidal effect’ measure because the former corrects for the mosquitoes that would have died anyway in the absence of insecticide. The value of the latter, σ′, is lower with increasing μ0, at constant μ t ; with μ0 > 0, σ′ can never be 1, even if μ t = 1. If δ is large, more dead mosquitoes may be found in control huts than in those treated, rendering both σ and σ′ negative, even if μ t ≥ μ0, wrongly suggesting that the intervention enhances mosquito survival. For instance, if μ t = 1, μ0 = 0.3, and δ = 0.8, then σ = − 0.143 and σ′ = − 0.1, which are counter intuitive values, especially given that the control-corrected mortality ω = 1.
μ ¯ ⋆ = 1 − δ 1 − ρ t μ t ⋆ + 1 − 1 − δ 1 − ρ t μ 0 ⋆ . Ψ = μ ¯ ⋆ − μ 0 ⋆ 1 − μ 0 ⋆ = μ t ⋆ − μ 0 ⋆ 1 − μ 0 ⋆ 1 − δ 1 − ρ t .
In Figure 1, the three quantities for overall insecticidal effect Ψ, σ and σ′ are shown depending on mortality in huts with intervention treatment, μt⋆, with a fixed mortality in control huts, μ0⋆, a fixed deterrence, δ, and fixed repellence, ρ t and ρ0. Overall insecticidal effect quantities depending on mortality in an experimental hut with an intervention. The proportion deterred from entering δ is kept constant at 0.4, and the proportion dead out of those that entered into an untreated control hut μ0⋆ is kept constant at 0.20. Also, the proportion repelled (unfed alive mosquitoes) out of those entered is kept constant at ρ t = 0.3 and ρ 0 = 0.1 for treated and control huts, respectively. μ t ⋆ is the proportion of mosquitoes dead in an experimental hut out of those that entered. Lines are drawn for μ t ⋆ ≥ μ0⋆. The graph of Ψ is a straight line passing through 0 at μ t ⋆ = μ0⋆, and through (1 − δ)(1 − ρ t ) at μ t ⋆ = 1 with slope (1 − δ)(1 − ρ t )/(1 − μ0⋆), and Ψ is positive for μ t ⋆ > μ0⋆. 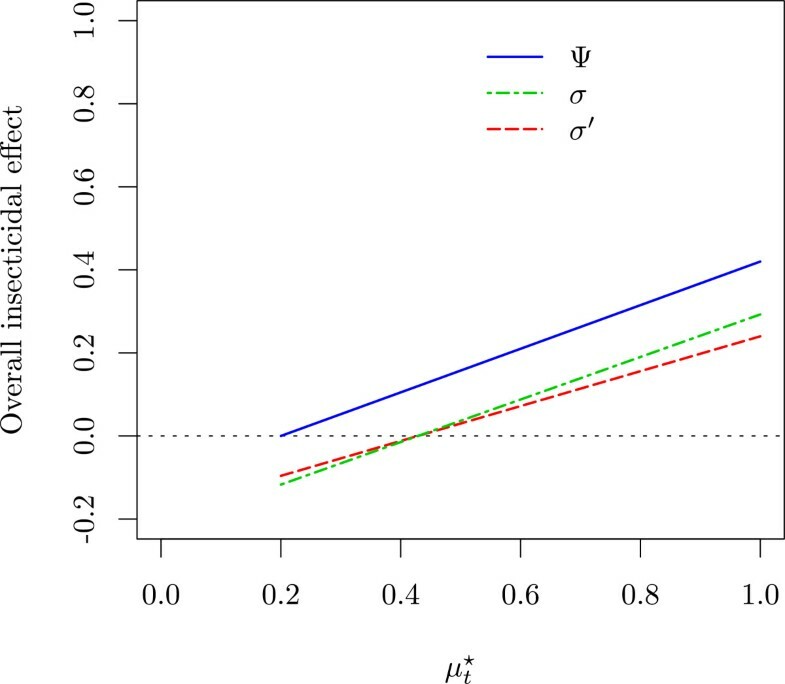 σ runs parallel to Ψ, and is negative for μ t ⋆ < 1 − ρ 0 1 − δ 1 − ρ t μ 0 ⋆ . σ′ is also negative for μ t ⋆ < 1 − ρ 0 1 − δ 1 − ρ t μ 0 ⋆ , but has smaller slope (1 − δ)(1 − ρ t ). μ ¯ c ⋆ = c 1 − δ 1 − ρ t μ t ⋆ + 1 − c 1 − ρ 0 μ 0 ⋆ c 1 − δ 1 − ρ t + 1 − c 1 − ρ 0 . Mosquito host seeking branching process. Mosquito states are represented by rectangular boxes, connected by arrows representing transitions between states, with the transition probabilities in unboxed text next to the arrows. Ψ c = μ ¯ c ⋆ − μ 0 ⋆ 1 − μ 0 ⋆ . The relationship of Ψ c with c is illustrated in Figure 3. 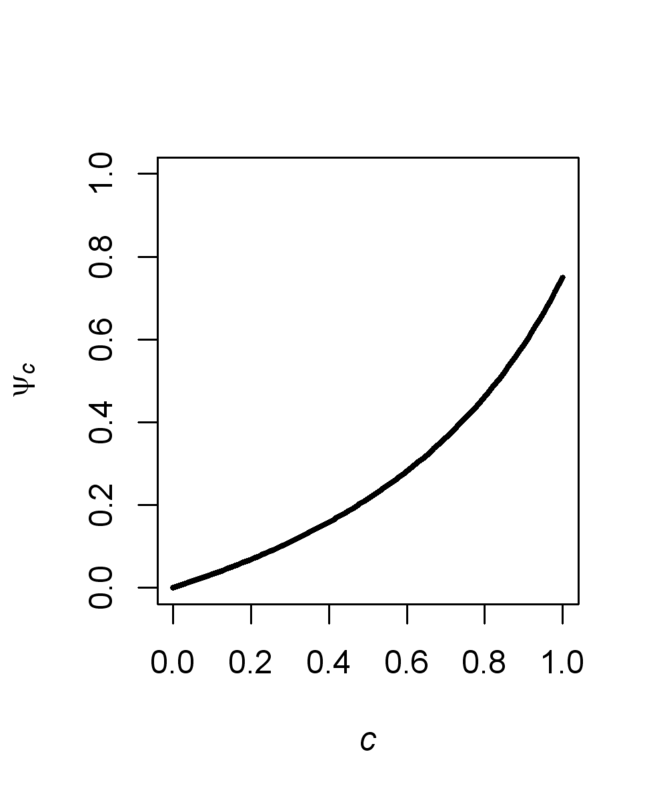 With increasing c, the slope increases. When c is low, the slope is approximately μ t ⋆ − μ 0 ⋆ 1 − μ 0 ⋆ / 1 − ρ 0 1 − δ 1 − ρ t ; when c approaches 1, the slope is approximately μ t ⋆ − μ 0 ⋆ 1 − μ 0 ⋆ × 1 − ρ 0 1 − δ 1 − ρ t .
Insecticidal effectiveness of intervention programmes depending on coverage. The proportion deterred from entering, δ, is kept constant at 0.4, the proportion dead out of those that entered in an untreated control hut, μ0⋆, is kept constant at 0.20, and the proportion of mosquitoes dead in an experimental hut out of those that entered, μ t ⋆, is kept constant at 0.8. Also, the proportion repelled (unfed alive mosquitoes) out of those that entered is kept constant at ρ t = 0.3 and ρ 0 = 0.1 for treated and control huts, respectively. Quantity Ψ c 's validity as a measure for the insecticidal effectiveness of an intervention programme depends on the assumptions’ validity. On the one hand, insecticidal effectiveness of indoor intervention programmes targeting indoor biting mosquitoes may be lower if deterred mosquitoes shift to outdoor biting and resting. On the other hand, deterred mosquitoes are at higher risk of dying because of the increased search time, thus insecticidal effectiveness may be higher. The quantity Ψ c provides a ‘quick and dirty’ estimate of the potential insecticidal effectiveness of an intervention programme. The effectiveness of an intervention programme against disease transmission depends both on protection against bites and the insecticidal effectiveness. If detailed information about the vector population is available, such as data on (or good estimates of) daily survival rate (in the absence of intervention), anthropophily, endophagy, and endophily, more sophisticated models (e.g. [4, 5]) can be used to predict impact on transmission. ϕ 0 = F 0 E 0 = ϕ 0 ⋆ 1 − ρ 0 . Φ c = ϕ 0 ⋆ − ϕ ¯ c ⋆ ϕ 0 ⋆ . The relationship of Φ c with c is similar to that of Ψ c with c. When c is low, the slope is approximately ϕ 0 ⋆ − ϕ t ⋆ ϕ 0 ⋆ / 1 − ρ 0 1 − δ 1 − ρ t ; when c approaches 1, the slope is approximately ϕ 0 ⋆ − ϕ t ⋆ ϕ 0 ⋆ × 1 − ρ 0 1 − δ 1 − ρ t . Note that Φ c can be biased if a proportion of the mosquitoes that enter huts is exophagic. aDue to the possibility of mosquitoes escaping or being lost (e.g. through predation), depending on the hut design, the total number of mosquitoes caught in the experimental hut generally underestimates the number of mosquitoes that entered. The number escaping will be higher with increased excito-repellence, but lower with increased insecticidal effect. bRepellence is defined here as the proportion of both unfed and live mosquitoes out of those that entered the hut and is not necessarily equal to the proportion of mosquitoes found in exit traps. All other mosquitoes collected (dead or both alive and fed) are presumed to have attacked the occupant of the hut. cAttractants, with more mosquitoes entering treated huts than control huts, are not considered here. dIt is assumed here that mortality as measured in experimental huts is not biased upwards due to the experimental design. Mortality could be higher in exit traps than inside a control hut due to increased desiccation risk or prolonged exposure to insecticide, if exit traps are not emptied regularly . The authors would like to thank two anonymous reviewers for helpful comments. This work was supported through the project #OPP1032350 funded by the Bill and Melinda Gates Foundation (BMGF). All authors contributed equally. All authors read and approved the final version of the manuscript.